Having studied Egyptology and ancient history for over thirty years, I specialise in the Old Kingdom with a particular interest in pyramid sites and their related mastaba fields. As part of my research into official titles of the Old Kingdom, I am compiling a corpus of Vth Dynasty false door inscriptions from Giza and Saqqara. As part of my Saqqara-based research I have worked as part of the Oxford Egyptian Expedition team led by Dr Yvonne Harpur of Linacre College, Oxford, in the tomb of the vizier Kagemni and on contemporary tomb reliefs and inscriptions in the Egyptian Museum, Cairo. 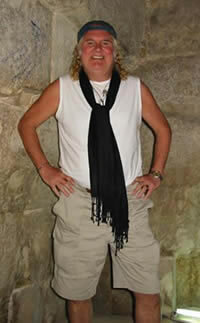 My published work includes articles and reviews in the Egyptology magazine “NILE Offerings”, the Nemes Online Archive and the Egyptian Ministry of Tourism website “Tour Egypt”, with regular collaborations with Dr Joann Fletcher on various projects, including their recently published biography of Alexander the Great and a forthcoming project on Old Kingdom burial sites.